As explained in the ‘1860 Rouquayrol Denayrouze’ chapter, in 2002 I had been lucky to find an original 19th century Denayrouze helmet in an antique shop in the south of France. Shortly thereafter I asked my friends if any of them knew of a regulator to go with the helmet. The only one who wrote back was Philip Nathansen of the Danish HDS. He sent me a picture of an original regulator made of steel and asked me if that was what I was looking for. It was, but the apparatus was property of the Danish Navy and not for sale. So the only option I had to get a working Rouquayrol Denayrouze (R&D) regulator appeared to build one. Philip again came to the rescue and arranged for my friend Rob Krul and I to come to Copenhagen in 2003 and inspect and measure the steel regulator. Once we had gathered all the measurements we required Rob proceeded to built the regulator with my assistance. 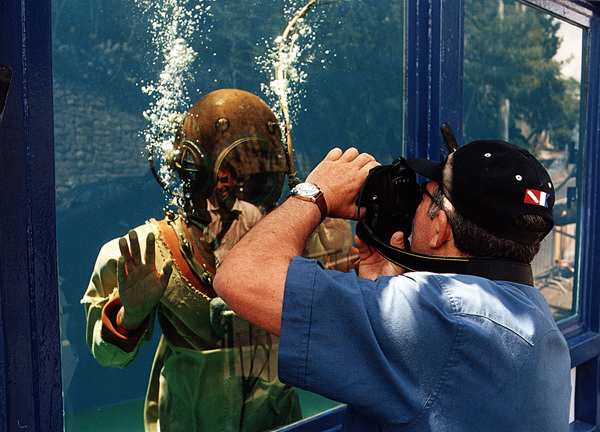 The first dive we made was in Holland on April 4, 2004. Rob and I dragged his two cylinder Draeger pump to the canal across the street in front of his workshop. Rob dressed in a drysuit and we strapped the regulator on his back. With his wife Sonja and myself at the pump, Rob descended a few meters and stayed down for about ten minutes. When he surfaced he had a big smile on his face and told us that this regulator was the smoothest breather he had ever dived. 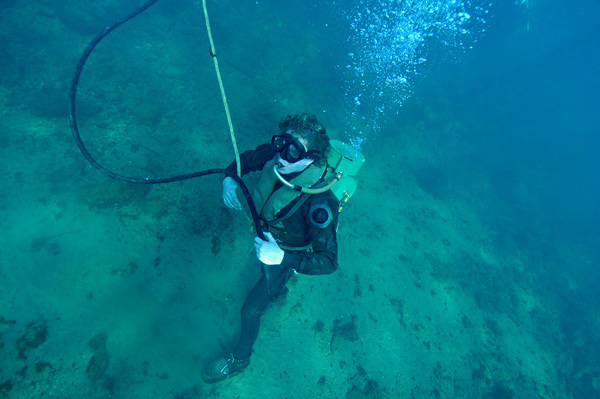 Rob and I decided to construct a small series of six of these regulators and in the months after the first test dive, we finished the other five units. Later that year we made an appointment with Philip Nathansen to return to Copenhagen with a regulator to allow the Danes to dive with it too. 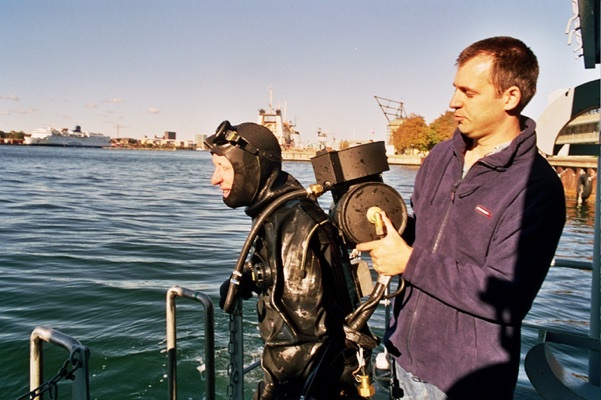 On October 11, 2004 we prepared to dive at the Holmen Navy Base in Copenhagen. Philip had brought an old two cylinder pump made by the German company of Friedrich Flohr and Rob and I brought our regulator apparatus. 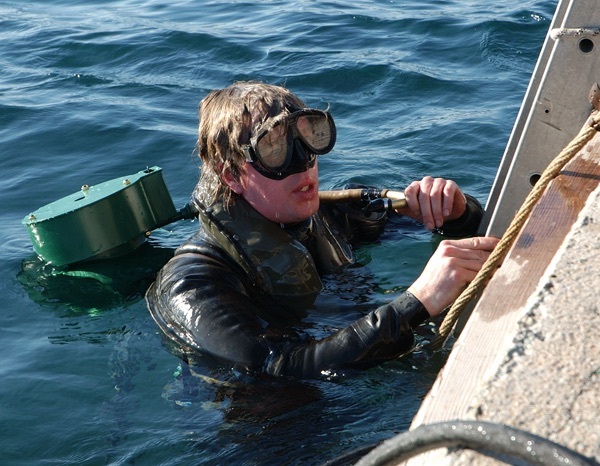 Along with "divers of duty" of the Danish Navy and the commander of the dive school, we dived one by one to approximately seven meters, where we still had a good visibility due to the cold water temperature and the sunny weather. It was absolutely great to dive this old machine and both navy diver Schultz and HDS member Gunnar Broge took photos underwater. In 2005 I was asked by Gilbert Jean, who operates www.pieds-lourds.com web site, and Jean Patrick Paszula, if I was available to make a dive with the regulator for a short film being made by the Italian television producer Luca Coltri. 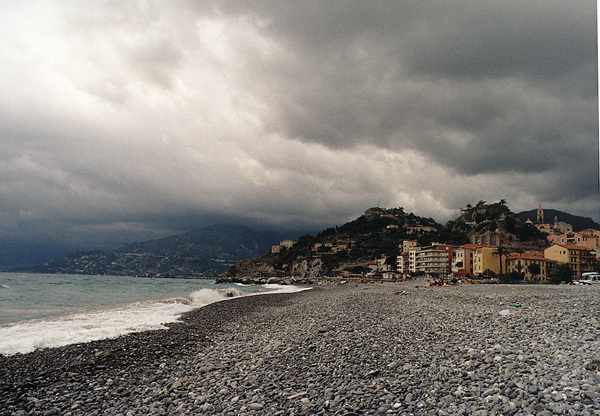 The film was to be made in the south of France. 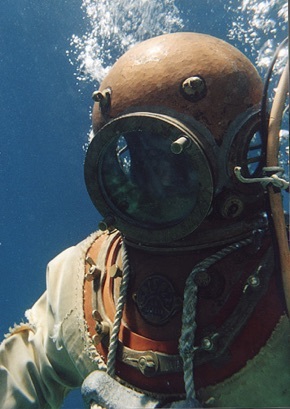 I liked the idea because I had promised some underwater footage to Dr. Joe Bauer, who had purchased a regulator for the museum in Islamorada, Florida. 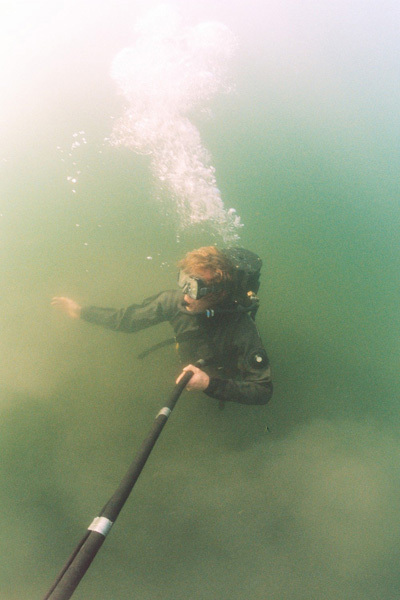 This time it would be difficult to dive with a hand pump as I had a lot of other equipment to take with me to France and an extra pump would not fit in my car. So I decided to use a scuba tank with a reducer instead. The reducer would be provided by me and the French would arrange the tanks with compressed air. I had tested the set in my own workshop at home in Holland and everything seemed all right, but I had no time to arrange to actually dive it in water. 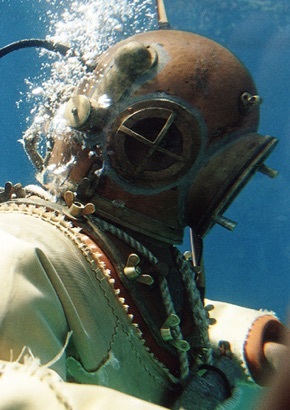 Two weeks later in France I dressed up in my old Admiralty AVON suit, strapped the regulator on my back, set the pressure to one atmosphere over ambient pressure (we dived in shallow water of 5 to 8 meters, just for the pictures ) and in I went. Cameras were all around me, but something was wrong. As soon as I descended the regulator started to breath with great difficulty and also it made a buzzing sound each time I tried to inhale. I returned to the surface and asked for a little more pressure on the air hose. I descended again, but the problem was not solved. I kept descending, and started acting for the cameras but felt like I was drowning because I had to fight for each sip of air from the regulator. 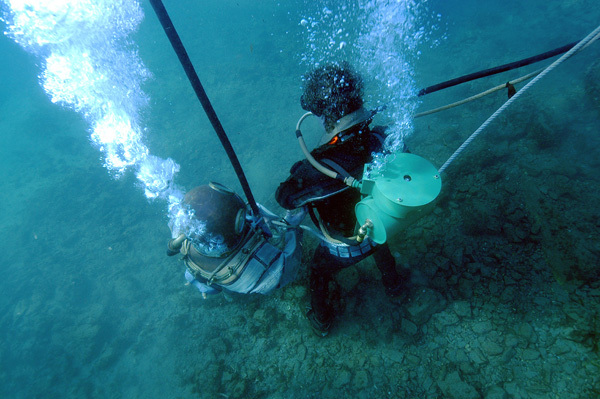 The Italians did not seem to notice and they happily filmed three types of diving apparatus that were there, The first was mine, the 'aerophora' as they called my regulator, then two standard dress divers and a French Navy combat diver with an oxygen rebreather. They were very pleased with the results. Once I returned to Holland I concentrated on what had gone wrong with the regulator and the problem was discovered some weeks after the dive. 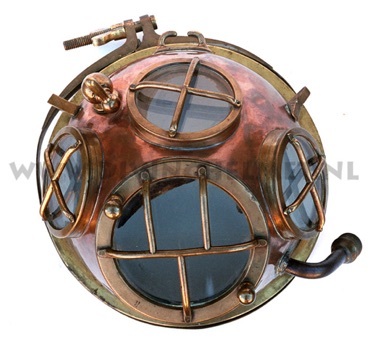 It appeared that we had made a mistake when constructing the main valve in the regulator. 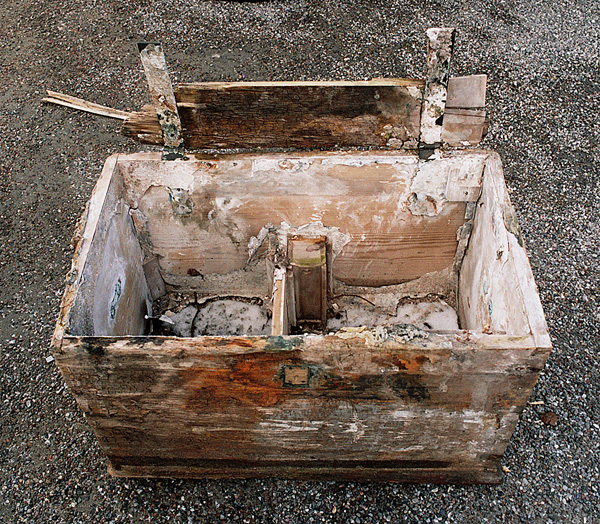 The valve unit inside the original regulator of the Danish Navy had been stuck in the units tank. This was because the entire regulator had been painted with black tar, inside and outside, and since it had been like that for at least 100 years we were afraid we would damage the apparatus if we took it apart. Instead of disassembling the original unit, we used old illustrations and drawings to figure out how it was to function inside. The main valve we had used was based on a hexagonal bolt instead of a round one like the original one had. This, we believed would provide an easier flow of air than the original round one, and Rob said it was easier to manufacture. 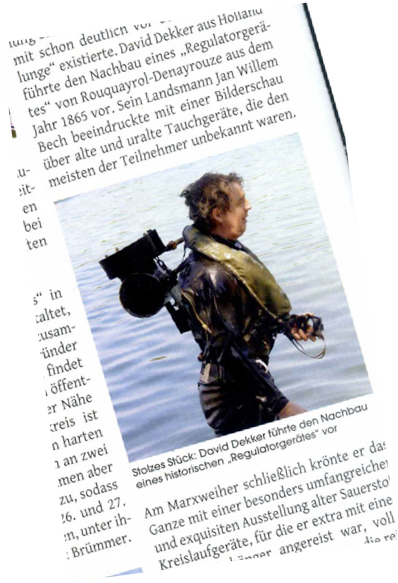 And indeed it was quite easy to breathe when diving at Rob's place with the Draeger pump and in Copenhagen with the old Flohr pump. Then it had been quite comfortable. But when I decided to use compressed air I apparently had a steadier pressure and probably a slightly higher pressure then what was achieved with the old hand pumps. As a result the valve would open when I demanded air but closed directly after because the 'shot' of air passing through the valve would lift the diaphragm and close the valve immediately. This happened several times per second resulting in a vibration of the valve opening and closing very fast (the buzzing noise I heard underwater) and a very hard breathing. When I went up to ask for more pressure I only made things worse. It was the worst dive of my life and I had done it in front of cameras! 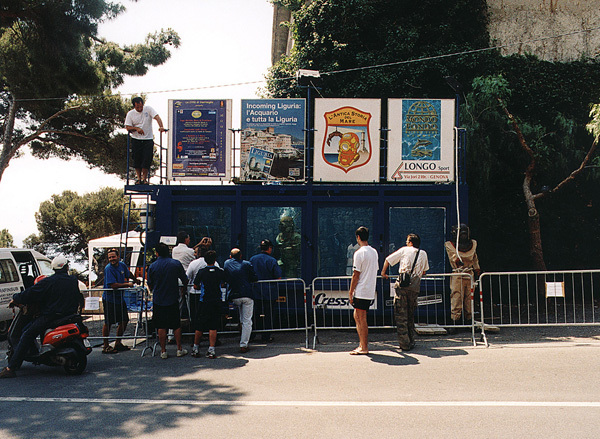 The film however was presented at the underwater film festival of Ventimiglia, Italy later that year and was well received. What we did to solve the problem with the valve in our regulator back pack was also possible because of another amazing discovery. 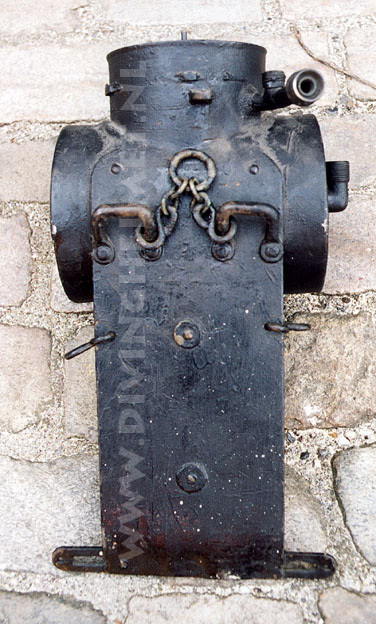 During our struggle with the valve two Danish divers had each found parts of old German diving equipment in the wreck of the Undine, a German warship sunk in 1915 near the coast of Denmark. 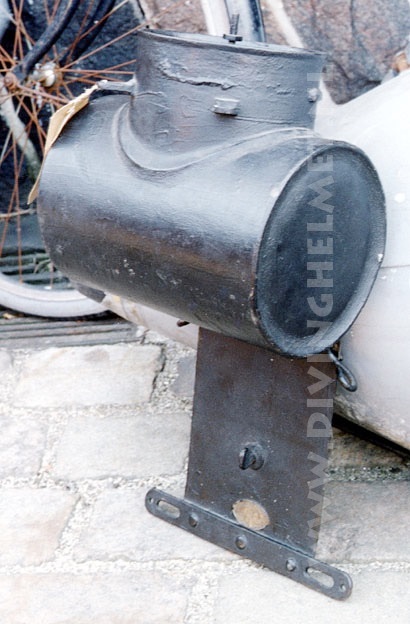 One diver found a mint 3 bolt helmet made by Franz Clouth of Koeln, the other diver also found a Franz Clouth helmet but in worse condition. 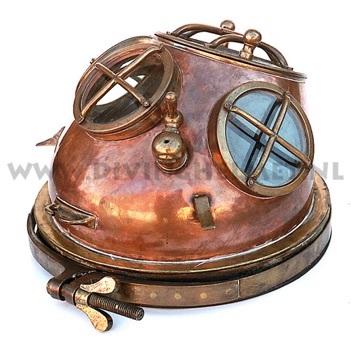 With the helmets was a large wooden chest with almost all of the rest of the diving equipment. In the chest were parts of the regulator backpack. 2005. 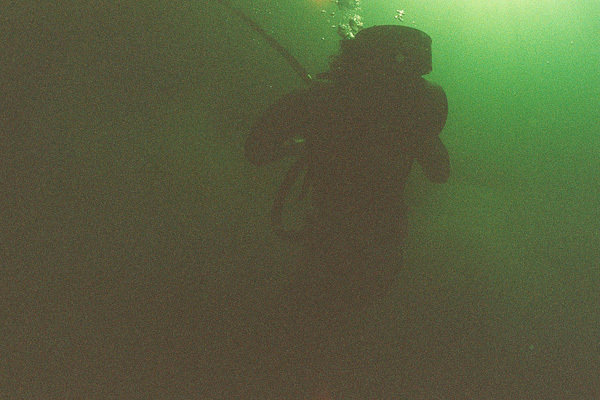 Diving the regulator in France. The underwater film festival in Ventimiglia, a mall town at the Italian side of the border with France, was only organized once I believe, but the film which was made by Luca Coltri was presented there and well received. There seems to be a youtube version of this film, I don’t have the address but when someone knows it then please send me a link. Thanks. Above: An Article by Wolgang Freihen in the German Magazine ‘Tauchen’. 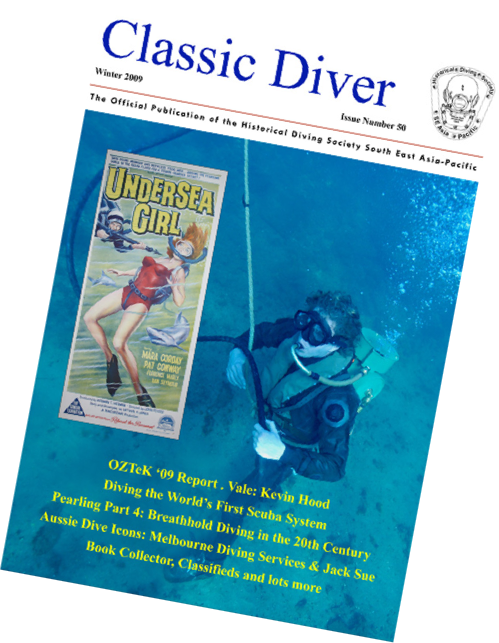 On the Cover of the Australian magzine ‘Classic Diver’. An article in the russian magazine ‘Kalashnikov’. 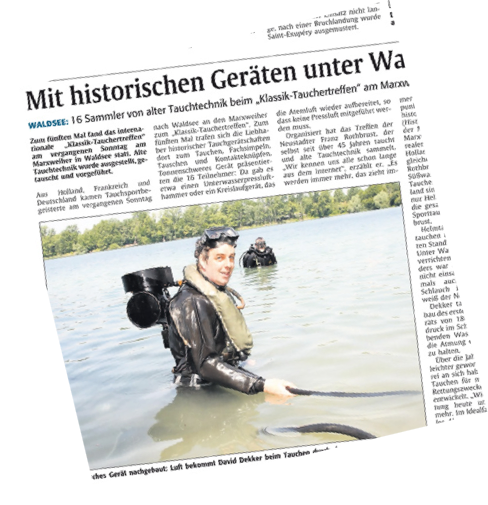 An article in ‘Die Rhein Pfalz’. 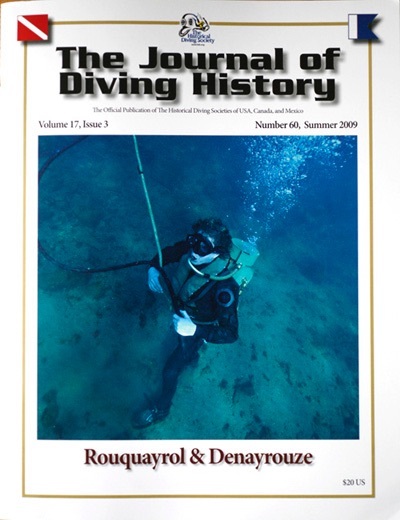 On the cover of the American magazine ‘The Journal of Diving History’. And here below: last but not least a 4 x 5 metres photograph in the Russian State Army Museum in St.Petersburg. In a time where lots of money are made by selling ‘imitation’ items it is important to avoid misunderstandings. The difference between a ‘replica’ item and a ‘fake’ item is mainly the intention of the maker / seller. A replica is made with the intention to treat and possibly sell it as a replica of a genuine item which is impossible to obtain. An imitation ( fake ) item is made to ‘fool’ people with: an item which is made to look like an item which is hard to obtain due to its price and then sold as the real thing often cheaper then the real thing, sometimes even at the same price as the real thing. All our projects concern items which we treat, promote and sell as replica’s. 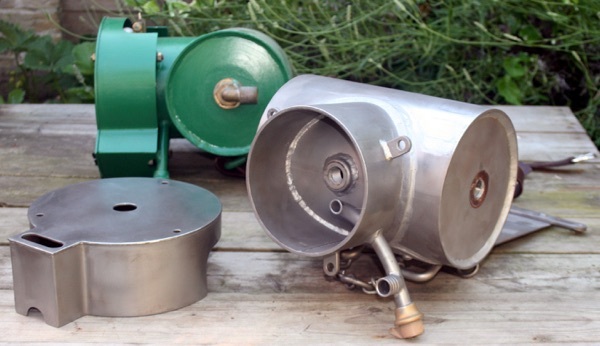 Also we search publicity to explain we are building these items as replica’s, we even mark our projects with stampings and serial numbers to be able to identify them as replica’s for in case one of our clients would decide to drop one off at Christies saying he found it at his granddads attic.